Perfectly situated in the north of historic Ibiza Town and a stone's throw from Santa Eularia, lies the refined and beautifully rustic Legado Finca Boutique Hotel. Ingrown lush gardens, enveloped by ancient apricot, fig and cocoa trees, this old travelers inn has found a new lease of life on the island having been lovingly reimagined and redesigned by owners Andy and Andreas. 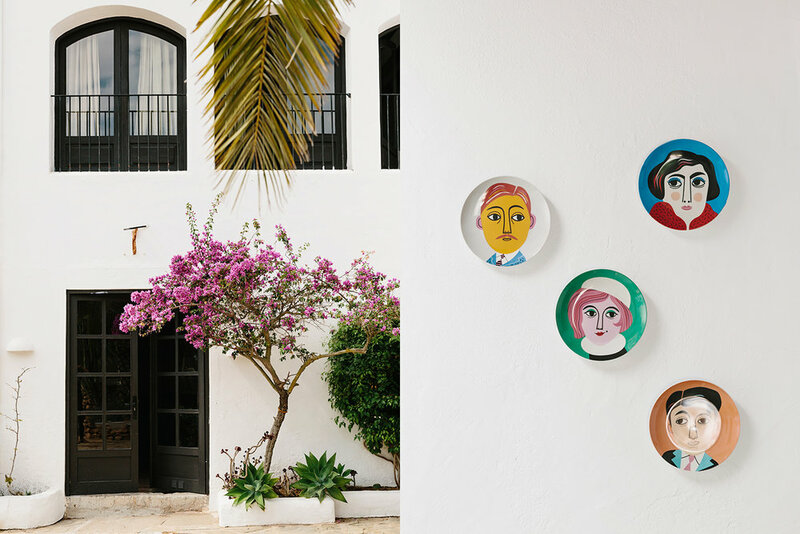 Legado, meaning Legacy in Spanish, absolutely imbues a sense of old Ibizan charm and is authentic and soulful as it extends its story as part of the growing slow living tourism scene on the island. When you’re not lounging in your luxurious room, enjoying the jungle style garden, sun-drenched terrace or crystal swimming pool, its ideal location allows for a quick drive to the secret bays and pristine coves of the northeast and a choice of wonderful restaurants nearby. A true Ibizan hideaway for those wanting to slow down and soak in their stunning surroundings of a beautifully designed, detail-driven, Bed and Breakfast. Legado features 7 exclusive suites. Communal areas, library, a lively bar and stunning new restaurant are located in the original farmhouse building beyond the pool and garden. The luxurious rooms all have their own private bathrooms, some with their own private gardens and beautiful outdoor sitting space, each beautifully designed with natural materials of concrete and wood. Each room feels like its own art gallery, dressed with coveted antiques and vintage items sourced on the island and from Andy and Andreas' own collection from their home in Vienna. Andreas' background as a fabric and set designer elevate Legado to an art hotel - infused with character and style at every corner. Legado invites relaxation like no other. Sumptuous poolside daybeds invite guests to linger and enjoy fresh juices and snacks from the poolside bar. During the summer months, the crystalline salt water pool is a perfect respite from the heat of the Balearic sun. Guests can enjoy a privately booked massage and transforming healing sessions under the pergola backed by a canopy of palms in the finca's own jungle style garden - the gentle hum of cicada's entice a deeply relaxing experience. The continental breakfast is exquisitely presented and is not to be missed. Leisurely mornings prescribe a reviving pool dip before coffee and freshly squeezed orange juice, followed by a selection of locally sourced, organic dishes that are sure to impress. Autumn and Winter is a glorious time to visit Legado, the quieter months are perfect to explore hidden walks and coves on the stunning coastlines. It’s also a special season of food and wine, freshly prepared, by Andreas Oberkanins. Located 9km from Puerto de Ibiza. High season rates start at $300. Low season rates start at $225. Ibiza’s old town Dalt villa, a UNESCO World Heritage Site, with its impressive fortress, castle and cathedral. Take a boat from Ibiza to the tiny island of Formentera where you can hire a bike or scooter to explore the island. There are beautiful diving conditions around the coast of Ibiza, with the sea bed in the Las Salinas National Park being a World Heritage Site.